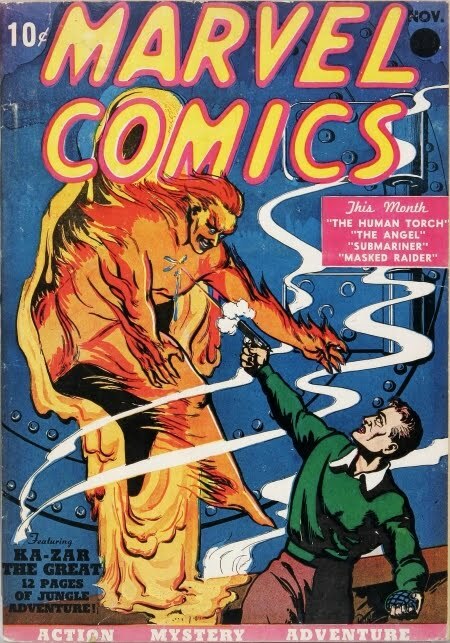 Kleefeld on Comics: Where Does "Marvel Comics" Come From? Where do you suppose the company Marvel got its name? If you answered that it's from the title of the first comic book they published, you would be only partly right. Martin Goodman did indeed publish his first comic book in 1939 and it was called Marvel Comics, changed to Marvel Mystery Comics for its second issue. The book featured what would become two of the company's most iconic characters of the 1940s, the Human Torch and the Sub-Mariner. In any event, the "Marvel" name was in place before Marvel Comics #1. Whether Goodman was actively trying to build a sort of "Marvel" brand or he just happened to like the word is unknown. But that's still only part of the story. Something to keep in mind is that comics distribution in the mid-20th century was very different than it is today. There were a wider array of distributors in place, and a newsstand (there were no comic shops back then) could choose to order from any number of them. Which meant that they spent fairly little amount of time looking through all the lists of things they could order. Lots of titles from lots of publishers meant that a newsstand operator scanned quickly, sometimes completely missing titles and even whole groups of titles. Unless you had the name recognition of Life there was no guarantee your title would show up at the same newsstand even two months in a row. One thing that publishers did to help counter this was to group titles together. You didn't order Superman, you ordered the group of comics that included Superman. Which meant that you also got, by default: Detective Comics, Green Lantern, World's Finest, etc. Even if you only wanted Superman. Fortunately, magazines and comics were returnable, so there was little risk on the newsstands' part if a given issue didn't sell. You ordered Superman and got a bunch of other stuff too. Maybe those would sell, maybe not. If they didn't, you shipped the covers back to the publisher and got reimbursed for the whole issue. The actual contents of the issue would get thrown out, but comics were cheap and considered disposable entertainment, so no one cared. But what this set-up did -- from a publisher's perspective -- was get new titles out into the newsstands on the coattails of a proven seller. Kids came asking for "the comic with Superman in it" so you ordered that. Maybe you'd sell an extra few copies of Detective while you were at it. Now, where am I going with all that? Prior to the 1960s, Goodman was publishing north of 30 comics a month. Some adventure, some Western, some romance... And you ordered them by groups. There was an adventure group, a Western group, a romance group... And what do you suppose the group with all the science fictiony monster comics was called? Marvel Comics Group. If you ordered the Marvel Comics Group of comics, you got Strange Tales, Tales of Suspense, Tales to Astonish, Amazing Adult Fantasy... Lots of aliens and monsters and whatnot. And eventually, in 1961, something new called Fantastic Four featuring another big monster on the cover. The superhero thing was a hit, so the creative folks at still-not-quite-yet-Marvel added more superheroes into the books that were in the same group as Fantastic Four. So we see the debut of Spider-Man in Amazing Fantasy, the debut of Iron Man in Tales of Suspense, the debut of Thor in Journey into Mystery... Lee was putting superheroes into books that were already being shipped out to the people who bought Fantastic Four. Or, more accurately, he was putting superheroes into books that were already being shipped out to the people who bought the comics group with other superheroes in it. Eventually, the superhero genre took off and largely pushed out the romance and Western books they had been doing. The biggest comics they were publishing were superheroes, all of which were under the Marvel Comics Group. A little bit of directed branding later and Goodman had a new name for his company. You are confusing some things here. The Ayer Directories are intended for advertisers, not specifically for retailers or distributors. So the groups listed in it are "advertising groups". Which means that you couldn't place an ad in one specific title in the group, but your ad would be in all the titles of the group. Note where it says "Space sold in combination as a group" under the Marvel Comic Group listing. Note that there are 2 groups, a Red Unit & a Yellow Unit. Each of those were an advertising group. 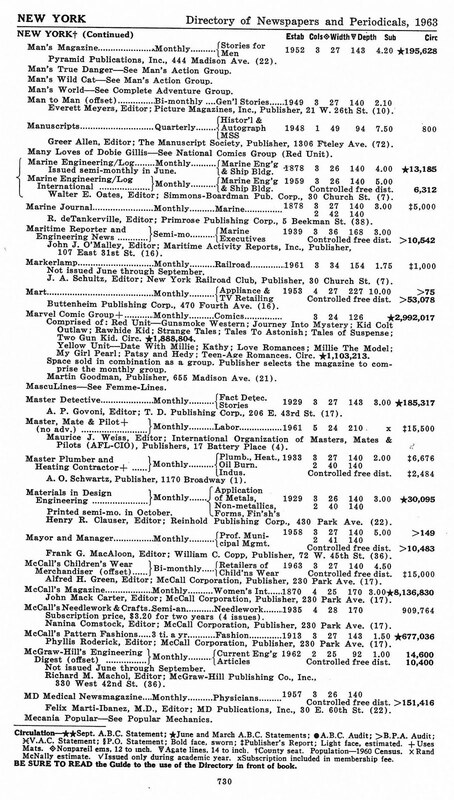 These advertising groups were promoted by publishers in trade journals to create brands. All of Goodman's comics are under the Marvel Comic Group listing. For example, this was the case in 1955 also, so there was not a separate adventure, western… In 1952 there were 3 Units: Red, Blue, & Yellow. Marvel Tales & Millie & Black Rider were all under the Red Unit advertising group. He put his men's mags under another group name entirely. As for how the newsstand retailer ordered his comics and magazines, that would be dependent on the local wholesaler and how they wanted to offer them. In some cases, the newsstand took what ever they gave him. The advertising groups were not relevant unless the wholesaler used them. Advertising was the driver, not distribution. Also, a newsstand was generally not free to order from any national distributor. The chain went - publisher to national distributor to local/regional wholesaler to newsstand to customer. The retailer was generally stuck with the national distributor(s) that his wholesaler dealt with. Some publishers were their own national distributor, but they generally went directly to the local wholesaler, not the newsstand dealer. This is after 1957. Before is much more complicated. These are not hard and fast rule, but the vast majority of comic books and magazines followed this method. I've also corrected some other misconceptions in your previous Ayer post. Wow. Excellent insights, Tim! Thanks very much for the clarifications here and on my earlier post. At one point, I briefly toyed with the notion of researching and writing about the history of comics retailing and detailing all this type of stuff, but I didn't want to step on Robert Beerbohm's toes and never did anything truly comprehensive. I know he's been working on it for years, but it's clearly the biggest hole in the vast majority of people's knowledge about the comics industry and one that I'd love to see someone at least start to fill. 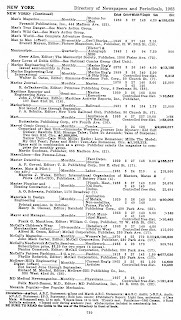 if you look at the covers of Marvel books in 1962 or thereabouts, you'll see a little white rectangle with a capital M above a capital C. Whenever Goodman started using that on his covers would be when the group as a whole started to be cover-identified as a whole entity rather than the individual shell companies listed in the indicia. the listing that you showed here does not indicate that the monster books were different from, say, the western books. It seems as though the adventure books were one grouping and the more humor focused books were another, which makes sense, really. Especially in light of Tim Stroup's further explanation of what the Ayer Directories were. The distribution side of the comics business has always intrigued me as well. It certainly does seem, if you follow the distributor slugs on the covers, that the publishers who were affiliated with/owned their own distributors did the best with the new Comics Code, which makes me wonder what would have happened to Goodman if he'd kept his own distribution company for a little while longer instead of going with American News right before their collapse. Mt. Marvel is mountain in Pilgrim's Progress where faith is demonstrated to move it with words. This is based on Matt 17:20. Book written in 1600'a by John Bunyan. Everyone who was reading it in schools. The most widely printed book outside the Bible in English language.